When it comes to performance and looks, it’s tough to beat the 2013 Honda CR-V. Those aren’t the only reasons that the crossover CR-V has remained a popular choice for Middletown and Mechanicstown drivers, though. It also comes with a large list of standard features, including Honda’s i-MID system, as well as an excellent safety record. When compared with the 2013 Subaru Forester, another competitor in the crossover class, drivers may find that the CR-V is a better option if they’re concerned about value and storage space. Some of these features are standard on higher level Foresters, but by then the price difference between the two vehicles begins to increase on the Subaru side, pin pointing the CR-V as the better value. Speaking of storage options, the 2013 Honda CR-V comes with more standard cargo room than the Forester, 37.2 cubic feet compared to 33.5 cubic feet. Even with the seats folded down, the CR-V still beats the Forester, with a maximum cargo space of 70.9 cubic feet compared to 68.3. cubic feet of space. Crossover owners like to put their vehicles to work, so some drivers may find that the extra cargo room is refreshing. 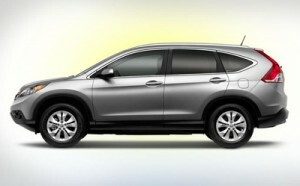 Come see why families continue to trust the CR-V and the Honda brand. Our dealership is located at 520 Route 211, in Middletown, just a quick trip five-minute drive from Mechanicstown and many other communities around Orange County. If you have any questions, please don’t hesitate contact our dealership.